Discussion in 'Military History' started by ian991, Dec 12, 2017. It is a bit demeaning to say the Mongols are from a later era and the people of the steppes did not have an advanced civilization even back then. It was quite common for the Chinese people to fight the Xiongnu, the Mongol's precursors, in the Warring States period and they had significant issues with them. Why do you think the first Emperor put so many people working on the Great Wall? There are vestiges of Ordos civilization culture tombs with steppe warlords entombed with their horses, weapons, scale armor, and the like. They were quite advanced in bronze making technology and they were part of a major chain of trade. With regards to the Chinese Qin dynasty era weaponry it was quite advanced but let's not diminish Western technology or military might from back then either. Alexander the Great lived during much the same era and he managed to conquer the Persian Empire which was itself quite sophisticated. The Qin did have iron weapons, but you have to remember they managed to do manufacture them because they used iron with high phosphorus content, which has a lower melting point, but is more brittle than carbon steel. So their iron weapons were good in that they were cheap and widely available, but were actually worse in terms of performance than well made bronze weapons. It was basically a numbers game. Heck, the Hittites had iron weapons, but eventually better bronze manufacturing methods meant that the Egyptians could still hold them at bay and even invade their territory. Not a lot of people know about this but only until many centuries later was steel of high enough quality to be substantially better than bronze. Unless you had access to some rare iron deposit like meteoric steel or something like that. There are daggers made of meteoric steel in really early Egyptian tombs for example. The crossbow was a major invention of the time in China though. Also the civil engineering techniques of the Qin were highly advanced. Before the Qin build that massive army they went through one of the periods of highest population and productivity growth in history. They irrigated a lot of previously uncultivated lands with major engineering projects where they diverted water to increase food production. They gave plots of land for people to cultivate. This meant that there was a large migration into Qin. Also the Qin forced people to marry at a really young age and gave them plots of land to both till and make a house. This resulted in a huge population boom which provided them with the manpower to field that huge army 2-3 generations later. Shift from iron to steel is easy, as it is easy to discover that adding carbon to iron would create steel, and adjusting the quantities and using different heating methods create different hardness and softness. This needs to be done by trial and experimentation, and we modern peoples should not underestimate that ancient peoples can be smart and resourceful too. Mixing iron with different quantities of carbon and phosphorus led to creation of the steel, and then the steel sword, in particular the dao, with a construction method that uses a soft core, the use of folding steel, differential heat treatment --- you apply clay on the sword while forging it, so different areas of the sword have different heat levels. Similar methods were also used with bronze, and the techniques were applied to iron and steel. This became the way Chinese swords are made, and same techniques are passed on to Korea and Japan, laying basis for katana. Qin Dynasty was the end of the Bronze period and is already in the transition to iron. By early Han, plates used for lamellar body armor has switched from bronze to iron then steel, and bronze jian to steel dao, which were two handed and had a ring pommel. One mistake people make is to assume Chinese warriors are poorly armored when in fact, what they are wearing are among the very best in the ancient world. You have fully laminar armor, where you have metal plates that are tied and woven together into a suit, with layers of leather and clothing underneath. Soldiers are fully clothed, they got boots, they got trousers, they wear shirts, and the clothing can be in multiple layers which aids you against both the cold and helps cushion blows. The way the Qin armor is designed, they allow for great comfort and flexibility. With lamellar armor, whether you are using bronze or steel does not matter much. Each plate is difficult to crack, and the impact is cushioned by leather and layers of clothing. Silk it turns out, is difficult to puncture through. Greek hoplites and Roman legionaires better not be like the way they are portrayed in modern drawings, with arms and thighs bare, and you are just wearing a skirt, your feet is in sandals, because in melee combat, regardless if you are carrying a shield or not, exposed skin is going to get cut. If you got a metal cuirass and bare chest underneath, impact against the armor would be a strong blow to the chest even if the armor is not penetrated. The soldier better be wearing cloth, leather or animal hide underneath to absorb the armor. Nah actually if you look at Roman "lorica segmentata" it should have similar or better protection than the armor you show. They basically used cloth and leather underneath to cushion it. Roman soldiers in colder areas would cover their limbs more. There were armguards "manica". These were typically used by gladiators and some soldiers also used that. In the later Roman Empire soldiers started using boots and long sleeves as well. The weather was colder so they adopted some of the clothing used by Celtic tribes. By that time soldiers were typically fully clothed and used "lorica hamata" armor which was actually worse than the much older "lorica segmentata" but it was cheaper to build and the empire's economy was no longer good enough to sustain expenses like that. Much earlier, in the time of the republic, the Romans also had used some kind of scale armor i.e. "lorica squamata". You should compare Qin Dynasty armor to the armors of the same period. Like Roman Republic or Punic Wars. If you want to compare later Roman armors like Lorica Segmentata to Chinese armors, you need to compare that against the Han Dynasty armors, which is better armored than Qin. I will explain more later post. Lorica Segmentata is considered laminar armor, which uses horizontal plates that are overlapping each other. But is Laminar armor any better than Lamellar armor? It is the number of plates that matter --- the more, the better. Qin Dynasty has 300 pieces, Han Dynasty has 600 pieces, and in later dynasties, this can go up to 2000. The question is whether you think laminar armor (segmented armor using broad stripes) is better than lamellar armor is subject to debate. Laminar armor was originally developed first, because they were cheaper to make than Lamellar armors. Its not a question whether the ancient Chinese had experienced or encountered people using laminar armors --- Central Asians and northern nomadic steepe peoples do use armor ---- but because they preferred in the end to use lamellar armors throughout centuries. If lorica segmentata is that effective, why didn't last? It only appeared in a certain segment of Roman history, and the armor may not be typical, but atypical of the Roman soldier, who can be using the more popular lorica hamata (mail armor) or lorica squamata (scale armor). If you look at the Byzantine Empire, they were using lamellar armors, as if coming to the same conclusion with the Chinese. Note that armor isn't just protection but also flexibility as well, and you are looking for the best balance from both. Lorica Squamata (scale armor) and Lorica Hamata (mail armor) might be more commonly used by the Romans. Lorica Segmentata looks cooler, great for movies and reenactments, but I would say Hamata (mail armor) is the best of the three. The saying of "Mongols are from a later era" is only statement of the fact that "Mongol" as a identification of a ethno-political entity only appeared because Genghis Khan created the word "Mongol" to identify the tribes that followed or joined him in the 1200s. Nothing more than that. Iron or steel weapons and tools appeared around the time of warring state, but iron based weapon was not broadly used until the Western Han dynasty. Qin Army's weapon are primarily bronze weapon from excavation evidence. However, China's bronze making is more advanced than the rest of the world if you look at the average length and breadth of the Qin bronze sword. They are close to one meter long (81-94.8cm) and narrow (max 5cm at the handle). This indicate the strength of the material is getting close to the earliest steel. Is there any other country around that period able to do so? I have only seen such length from Mycenaean tombs and very rusty. Alexander's conquest of Persia are not because of his advanced weaponry but because of his smart tactic and organization skills that Darius III and Persian state lacks, the same that Qin's victory is more about system advantage rather than weaponry. This is to say that "presenting Chinese tech advancement in certain area" has nothing to do with diminish other civilization. Some example from the Qin terracotta tomb Pit 2. And pay attention to the perfect condition after more than 2000 years. Who else could do that? Recently, the Emperor Qin Terracotta Warriors National Treasures and Cultural Relics Exhibition displayed bronze swords, copper spears, copper crossbows and other bronze weapons unearthed from the Mausoleum of the first Emperor in Chinese history alongside the tomb's world famous Terracotta Warriors. 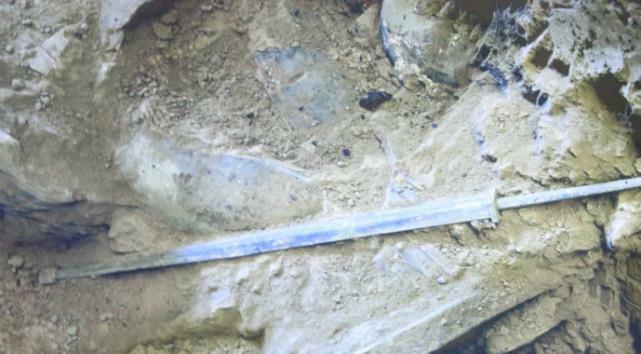 Amazingly, the weapons shone without a hint of rust, appearing as new as the day they were buried over 2000 years ago. According to Peng Wen of the Emperor Qin Terra-cotta Museum, the secret lies in chemical chrome plating. With electron probe micro-analysis and laser analysis, the China Research Institute of Nonferrous Metals and the Chinese Academy of Geological Sciences discovered that bronze swords unearthed from the mausoleum are coated with about 10 to 15 microns of chromium salt oxide. The discovery indicates that during the sword-smithing process, ancient Qin workmen consciously added Chromate and Dichromate to the bronze weapons, producing a light grey or dark gray sheen. The workmen thus improved the corrosion and rust resistance of the weapons, while maintaining their luster and sharpness. Chromate oxidization is an advanced technique and there are only two ways to achieve it: chemical chrome plating and chromium electroplating. The latter was development during the twentieth century; Germany and the U.S. both claimed patent rights to the process in 1937 and 1950, respectively. Apparently, the ancient Chinese developed chemical chrome plating techniques more than 2000 years earlier, undoubtedly a miracle in the history of metallurgy. That chromium oxidation technique that could not have been done without electricity. But no archeologist would ever admit ancient people could already have discovered and used electricity.